What is an evangelical agnostic? Someone who is passionate yet ambivalent. 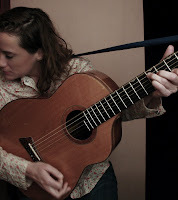 A church member turned me on to folk singer Susan Werner. She is funny with a good message. Here is a little medley of tunes from her album Gospel Truth. Is there a God above? She certainly speaks to me, and is good entertainment also! Delightful. I love Susan Werner. This is perhaps my favorite song of hers. Heard it? Do you have some kids? You really were good at it. His name is Tyler and he's three years old. I'm sure that you remember I was weird in school. I'm sorry about Jesus and all that you know. When I memorized the Bible I went overboard. And I prayed for your soul and you were saved, you said. Oh I was weird in school. I try to just forget about it all. So how is your mom? Yeah she made me laugh. Oh yeah I guess she does. I guess she always did. He's got the house out by the reservoir. I only see him maybe once a year. Who doesn't beat her up. I'm hardly like the person that I was back then. I never read the Bible. I don't pray to God. I'm not real sure he listens, you know what I mean. But I really hoped he did when I was seventeen. I haven't heard that song. A slice of life, eh? Yeah - makes me think of my brother, Eric. I'll bring it in for you.